ASSOCIATED PRESS The Penn State offensive line, with Connor McGovern (66), could boast a starting lineup with no one shorter than 6-foot-4. STATE COLLEGE — The top priority for Penn State opponents this year, of course, will be to stop or at least contain Saquon Barkley. First, though, they’ll have to find him. 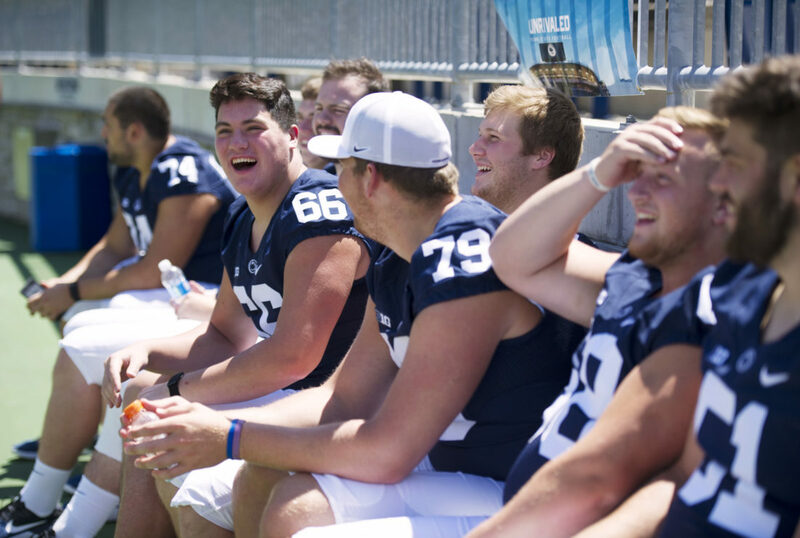 The Nittany Lions could well field the tallest offensive line in their history, the perfect complement for the shifty Barkley to use his jump cuts to dart through, bolt around, leap over or steamroll the awaiting schedule. Penn State may not start a linemen under 6-foot-4. Connor McGovern is the expected starter at center. He’s 6-foot-5. Ryan Bates and Steven Gonzalez probably will be the guards. They’re both 6-4. The tackles are more up in the air, but if Andrew Nelson and Brendan Mahon are deemed sufficiently recovered from injuries and illnesses that cost them both the second half of the 2016 season, they certainly are the most experienced with a combined 56 career starts. Nelson is 6-6; Mahon is 6-4. This trend of tall linemen is not a coincidence. James Franklin has emphasized versatility in his recruiting. In fact, the players, at least publicly, are only assigned the position of “OL,” not C, G or T.
“I think Bates is a really good example of that as a guy that could play center, guard or tackle,” Franklin said. “We want to recruit true tackles, and tackles could slide down inside and play guard if you had to. But if you recruit too many guys that could only play center and guard, they’re kind of sawed off, short-limbed guys, it eliminates flexibility. A Pittsburgh native and product of Jerry Kill’s regime in Minnesota before taking over at Penn State following the departure of Herb Hand, Limegrover’s work has drawn rave reviews from his players. “Coach Limegrover has turned a group of individuals into a unit,” Mahon said. He has particularly strong chemistry with offensive coordinator Joe Moorhead. Though five years older, Limegrover has known Moorhead since their days at Pittsburgh Central Catholic High School (Dan Marino’s alma mater) and, even further back, both attended St. Bartholomew’s elementary school. The Lions’ stunningly quick development their 2-2 September has raised the bar of expectations for this year, and Limegrover knows it all starts up front. Almost immediately after the Rose Bowl, McGovern was informed he was being switched to center. All nine of his starts as a true freshman last year came at guard. Though he grew up playing center, McGovern was not accustomed to the shotgun formation. Moorhead’s offense is run from the line of scrimmage, and the quarterback never goes under center. Bates started all 14 games — the first 10 at guard and the last four at tackle after Paris Palmer’s season ended — and was named to several freshman All-America teams. Gonzalez started three of the last four games at guard, including the Rose Bowl. 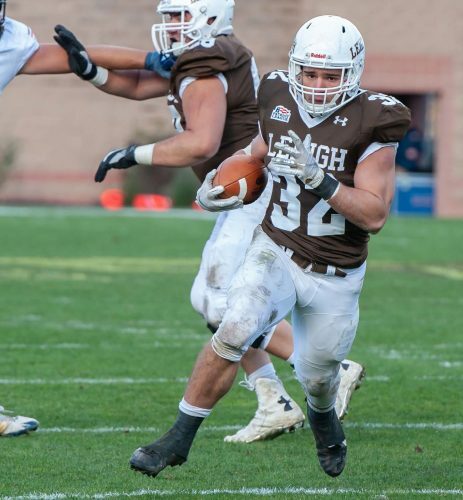 He’s also a beast in the weight room, his 38 benches with 225 pounds setting a team record at Lift for Life. On the edges, Mahon was establishing himself as a top pro prospect last year before an undisclosed illness hospitalized him and sidelined him for the last six games. Still, he cracked Pro Football Focus’ team of the week three times and is expected to be an anchor this year. Nelson, too, is part of the Lions’ heart and soul. His season ended to a knee injury in the sixth game, against Maryland, and, arm-in-arm with his teammates, he could be seen singing the alma mater with tears running down his face after the Senior Day victory over Michigan State. Franklin said both veteran tackles are being monitored. Chaz Wright started the last five games (for Mahon) last year, and redshirt freshman Will Fries, who redshirted last year, is in the mix at tackle. Wright is 6-7, Fries 6-6. Michael Menet, another decorated recruit who redshirted last year, remains a top prospect but he’s lost some time in camp due to an injury. He’s 6-4. Hollidaysburg’s Zach Simpson (6-3) is a backup who can play guard and center. True freshman Mike Miranda (6-3) has impressed as well, but the staff is still contemplating whether to redshirt him. As a group, the difference over the past year is noticeable.